Ayudha Puje (ಆಯುಧ ಪೂಜೆ) or Ayudha Puja marks the end of Navaratri. It is the day before Dasara. Ayudha Puje is essentially the worship of implements (or tools/weapons) that we use. While this is practiced in all southern states, since Dasara is Karnataka’s nADa habba (ನಾಡ ಹಬ್ಬ) or “the festival of the land” it is done so with added fervour in Karnataka. At least it does seem so if you see the roads for the next few days! As part of Ayudha Puje, everybody washes and decorates their vehicles (well, they are our major weapons in more than one sense) and worships them by squashing a suitable amount of nice and juicy lemons with great vengeance. Ash gourds (Winter Melons) are also shattered with furious anger. 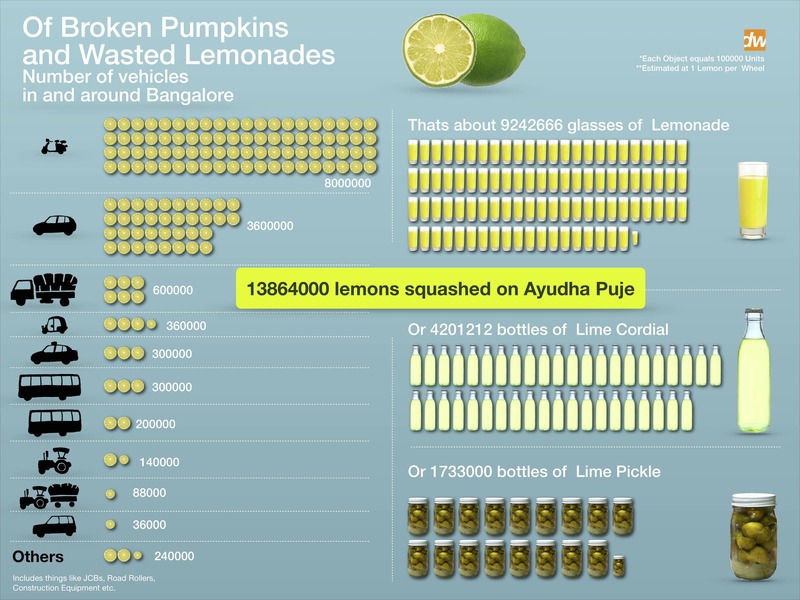 Just how many lemons got squashed on the last Ayudha Puje in and around Bangalore? We dug up some data from a few sources (Praja, Bangalore City Traffic Police, RTO, a Hindu article), and came with a quick and dirty estimate on the number of vehicles in Bangalore. We estimate that there are about 55 lac vehicles in and around Bangalore. You can download the data we used and our approximations here. We don’t have an estimate on how many Ash Gourds were broken, but we are sure the quantity would have been at least enough to serve tasty Halwa to every person in Karnataka. DataWeave helps businesses make data-driven decisions by providing relevant actionable data. The company aggregates and organizes data from the web, such that businesses can access millions of data points through APIs, dashboards, and visualizations.